In response to the Deltopia riots of 2014, the University of California, Santa Barbara commissioned its own series of springtime festivities during the first weekend in April, sponsored largely by the university and orchestrated by several campus organizations. Associate Dean of Student Life Katya Armistead called the effort a “shared” fiscal responsibility falling primarily on the UCSB Division of Student Affairs and the chancellor’s office. According to UCSB Chancellor Henry Yang, this responsibility has in large part been fulfilled through funds from private donors. Additionally, the Associated Students Program Board provided about 25 percent of the funds needed for its April 4 concert, with some raised through the sale of almost 3,200 tickets to the event. ASPB Commissioner Benjamin Simons has been involved in the collaborative effort between student groups and higher university powers since its inception. The success of Delirium, a concert organized by ASPB last Halloween as an exclusive alternative for UCSB students, prompted the administration to sponsor similar activities during Deltopia. “Their biggest goal was, ‘What can you give us to get the most kids out of IV?’” Simons said. 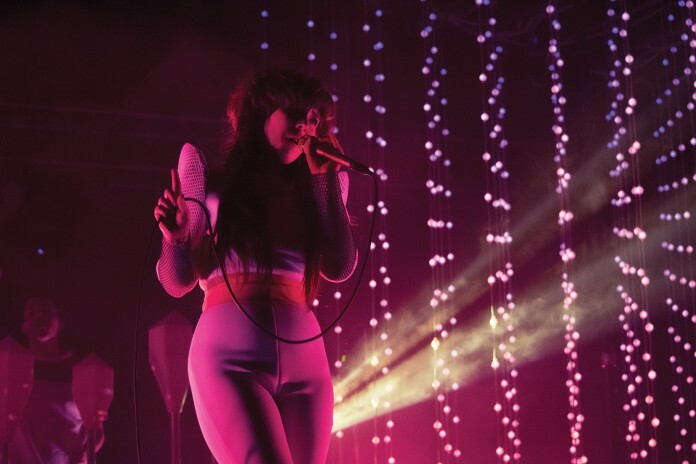 ASPB’s response to this challenge was to plan another UCSB-exclusive concert, this time featuring DJ/producer Sweater Beats and synthpop duo Purity Ring. Simons also assisted Armistead in approaching additional campus organizations such as Magic Lantern Films, the Recreation Center, and KCSB about programming during the day and the night preceding Deltopia as well. DJ Palladino, director of Magic Lantern Films, was approached by Armistead about two weeks before the end of winter quarter with a challenge to fill the approximately 800 seats of UCSB’s Campbell Hall on the night of April 3, to head off Isla Vista festivities. The university subsequently agreed to front the $1,600 cost of his proposed answer, a marathon screening of the fourth season of Game of Thrones. Thus, “The Warm Up” was born. Though the name is the brainchild of ASPB, Simons suggested expanding its scope to brand not just the concert, but the collective university effort. In weeks preceding Deltopia, activities commissioned by the various groups were all designated under the banners of a Facebook page and university website sporting the name. Because funding for the programming was not approved until the end of February, ASPB and other groups had little over a month to complete necessary preparations. Simons said his team worked around the clock to ensure everything came together in time for Deltopia. “They worked through dead week, they worked through finals, they worked through spring break, [and] they worked through the entire first week to make this happen,” he said. When an artist enters into one of these contracts, a radius clause dictates how long they much refrain, before and/or after an event, from playing another event within a certain distance of that venue. Because larger venues traditionally book their acts well in advance, many artists who might have been considered for The Warm Up were ruled out from the beginning due to such contractual obligations. University subsidization of the concert tickets allowed ASPB to sell them at a reduced rate of five dollars; free admission was out of the question, with most of the organization’s budget already accounted for by annual events such as Extravaganza and concerts like last year’s Childish Gambino appearance at the Thunderdome. However, Simons said the larger goal in requiring tickets was ensuring that students would actually show up. Though ASPB did not sell out the concert, as this would have put ticket sales closer to 5,000, Simons feels that it accomplished its objective of preventing unrest in IV. The feedback he has received so far about the event has been overwhelmingly positive. “I think this proved that a concert does do something [and] is effective in getting people off the street,” he said. The Magic Lantern marathon also fell short of expected attendance, at around 200 students, though Palladino admits that it was difficult to gauge exact numbers at a free event. Regardless, he sees the implementation of on-campus alternatives as a wise approach in the wake of last year’s destruction. “If they hadn’t been prepared for it this year, they would have looked like idiots,” he said. Though it remains to be seen whether the spring programming will become an annual trend, Simons hopes that ASPB’s introduction of both Delirium and The Warm Up will help such events become a greater campus priority.